What Are the Different Types of Network Cables? While you rely on cloud storage and wireless networks for data transfer, network cables still have a place in your tech closet. Even though your small business is thriving, there are always ways you can improve. While you rely on cloud storage and wireless networks for data transfer, network cables still have a place in your tech closet. Here is more information about the different types of network cables. Twisted pair network cables are most often used for Ethernet connections. As stable as your company’s WiFi network is, Ethernet can ensure that the connection is both faster and more reliable. The phrase twisted pair cable is derived from the two cables twisted together. This twisting method is intended to avoid interference from other electronic equipment that might disrupt the data flow. There are shielded and unshielded twisted pairs, with shielded twisted pairs being the preferred choice of businesses because it can hold more bandwidth. Cat5e and Cat6 cables are both examples of twisted pair network cables. Coaxial cables are still commonly used for televisions and low voltage needs. But before the advent of twisted pair network cables, coaxial cables supported the original Ethernet infrastructure. Copper wiring protected by insulation transfers the data, but in today’s world of high-speed Internet access, the twisted pair has long eclipsed the coaxial. Even so, some offices, especially older ones, still depend on coaxial connections. 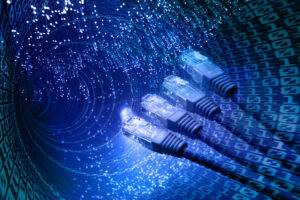 Fiber optic network cables are much more advanced than their counterparts described above. Beneath the insulation, there is a tube of glass that shields the cable from outside interference as beams of light travel down these tubes carrying data back and forth for your business. These cables are not always the most affordable, but they are also the most efficient. For long-distance transmission, you will need to use single-mode fiber optics, but for shorter distances, you can trust multi-mode fiber optics to complete the data transfer. USB is an acronym for Universal Serial Bus. These cables might be more familiar to you as ways to connect computer accessories such as external mice, keyboards, and headsets to the computer instead of cabling to facilitate network access. However, special adapters exist that allow Ethernet cables to connect to a USB port on the computer or router and continue to run as though nothing is out of the ordinary. That said, using USB network cables in this fashion is only meant to be a short-term solution. Better, more secure, and more stable answers come in the form of twisted pair and fiber optic network cables. Regardless of what type of cable is in use, the industry is always working to unlock the potential of new trends that will surpass the need for physical wiring as we look to enter an entirely digital era in telecommunications. This entry was posted on Thursday, March 29th, 2018 at 1:55 pm. Both comments and pings are currently closed.